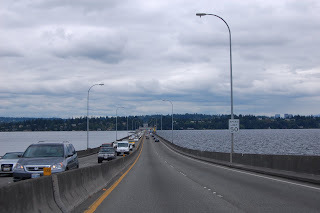 I love the rough/calm divide on the Evergreen Point Floating Bridge (SR520) between Seattle and Bellevue. Prevailing winds in Seattle are from the south, leading to this typical picture when headed eastbound across Lake Washington. The floating bridge becomes a boundary to wave action at the surface of the lake, so there is a smooth section on the leeward side. The bridge is undergoing replacement in the coming years. A toll is expected to be implemented in 2010 to fund the replacement project.